A news item involving 2018 North Korea–United States Singapore Summit was featured on Wikipedia's main page in the In the news section on 12 June 2019. This is the talk page for discussing improvements to the 2018 North Korea–United States Singapore Summit article. 2018 North Korea–United States Singapore Summit is within the scope of WikiProject Donald Trump, a project dedicated to creating and improving content related to Donald Trump. If you would like to participate, visit the project page, where you can join the discussion and see a list of open tasks. This article is within the scope of WikiProject Singapore, a collaborative effort to improve the coverage of articles related to Singapore on Wikipedia. If you would like to participate, please visit the project page, where you can join the discussion and see a list of open tasks. 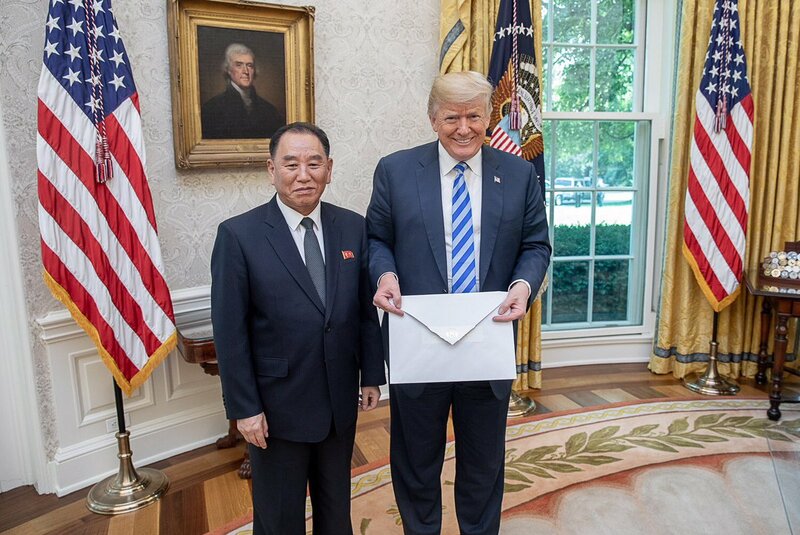 I was looking for the public domain picture regarding the article below: example - the picture of USA President Trump with the envelope from North Korea. Suggest to remove "The people in Singapore are divided about the resumption of the Trump–Kim summit; some believe that it is a small but encouraging step towards world peace whilst others are dissatisfied with both leaders." under the "Reactions" section. From my understanding, the opinion from the media below is also improper to keep it as it is not an official opinion but opinion from the two of the many presses. Could we remove it? North Korea tested what some sources argued may have been its first hydrogen bomb on September 3. I added an image of Hwasong-15. The caption was challenged for having nothing to do with the image. Instead of just changing the caption, the whole image box was reverted. I think the caption was relevant, but nevertheless I changed the caption, making sure its relevance was immaculate. It was again reverted, but this time without an edit summary and without discussion on this talk page. I added a message on the user's talk page, asking for an explanation but have not had a response after waiting for the last few business days. I went ahead and changed the caption again, making sure its relevant, and I get reverted again, this time by a different username, on the basis that it was previously challenged. Regarding Kim Jong Un's new move, I think that the focus of North Korea is now changed after Trump-Kim summit as it did not happen previously. Would it be possible to add the summary of this article below to the reaction part? Hello @Zzz:, Would you be able to clarify your opinion why you believe that the negative comment below is only well sourced? "Some commentators have expressed skepticism towards the signed agreement pointing to a history of failed past agreements and to the vague wording of the declarations"
From my understanding, the summary of the reaction below is also well sourced by the numerous global newspapers. "The summit received a generally positive international reaction with most countries expressing praise or hope for achieving a peace deal from the summit". Regarding the user:NPguy's personal assessment "official comments (i.e. from governments) have generally been positive while unofficial comments have been mixed"
I believe that some Wikipedia users might have a positive or negative opinion with the Trump-Kim summit. However, it would be a violation of WP:NPOV. Selecting the negative comments with unofficial comments while it have been mixed, and emphasizing the contrary opinion on Wikipeida. "Avoid stating opinions as facts. Usually, articles will contain information about the significant opinions that have been expressed about their subjects. However, these ::opinions should not be stated in Wikipedia's voice. Rather, they should be attributed in the text to particular sources, or where justified, described as widespread views." Hello, Goodtiming. Can you show us some of these 50+ references you say support the notion that “international reaction was generally positive”? You did add one reference, from moneycontrol.com, an “online business news website” in India. It reports a statement by the UN Secretary General saying the meeting was “an important milestone”. That’s good as far as it goes, but it’s one person’s comment; it doesn’t support us saying that “international reaction was generally positive”. It's the kind of single statement that belongs in the article International reactions to the 2018 North Korea–United States summit, which is already linked under the Reactions section. That article does not attempt to summarize the international comments, it merely lists them. The photos of Return of the remains of US soldiers: it is one of the examples great photo related with the summit, As there are several compelling and informative images of the aftermath of Trump-Kim summit, it would be beneficial to keep Gallery section. Wikipedia policy: the issue with the image without description and it specifies that the point with the media files with no accompanying text. So the related image with explanation would be acceptable. "Dissent: I oppose the removal of the gallery section as the photos of Tump-Kim related events are useful information for the public in the current multimedia era. * Alternative option: "
Delay in peace declaration leads to hostile rhetoric. Inside the dispute delaying resolution of the nuclear issues. On August 29th, the Atlantic reported on an interview with Moon Chung In who is the special envoy from South Korea. His understanding is that the diplomatic team of Mike Pompeo is having difficulties discussing with the defense team National Security Adviser John Bolton; This divided stance between the US Diplomatic team and the US defense team may have played a significant role in the delay of the signing of the promised peace declaration. Diplomatic Team Secretary Mike Pompeo is strongly in favor of adhering to the agreement set out in the summit, whereas John Bolton insists that a complete denuclearization of the DPRK must be established first before a peace treaty can be formally imposed and thereby ending the Korean War. Also on August 29th, The Hill reported on the U.S. presidents verbal agreement with DPRK to end the Korean War, on both the June 1st meeting at the White House, and during the Summit held in Singapore. However, soon after the Summit meeting, the U.S. demanded denuclearization from North Korea before signing on the Peace Declaration document which eventually leads to an ever more hostile rhetoric from North Korea. ^ "Inside the Dispute Derailing Nuclear Talks With North Korea". Aug 29, 2018. ^ "Moon adviser says end-of-war declaration won't lead to pullout of U.S. troops". Aug 29, 2018. ^ "Moon's Adviser: War-Ending Declaration Will not Affect Alliance with US". Aug 30, 2018. ^ "Trump reportedly promised Kim Jong Un he'd sign a declaration ending the Korean War". Aug 29, 2018. ^ "Trump promised Kim Jong Un he'd sign an agreement to end the Korean War". Aug 29, 2018. ^ "Trump promised Kim he'd sign declaration ending Korean War at summit: report". Aug 29, 2018. ^ ""Prevented war with North Korea in 1994 – here's what needs to be done". .inews.co.uk. Archived from the original on 2017-09-10. Retrieved 2017-09-10. ^ "Agreed Framework of 21 October 1994 Between the United States of America and the Democratic People's Republic of Korea" (PDF). IAEA. 2 November 1994. INFCIRC/457. Archived from the original (PDF) on 17 December 2003. Regarding your edit: "19:08, 13 November 2018‎ 130.126.255.248"
Please see the updated references below and let us know your opinion about the contents below. The contents below are the summary of the multiple references below. 1) US Diplomatic team and the US defense team has a different point of view to the solution for the North Korea Nuclear issue. 2) The leader of US Diplomatic team: Mike Pompeo has a bit flexibility to negotiate with DPRK and his team may consider the declaration ending the korean war. ^ "Mike Pompeo faces a moment of truth on North Korea". Aug 23, 2018. ^ "John Bolton and Mike Pompeo are headed for a clash". Oct 5, 2018. ^ "John Bolton: North Korea has not 'taken effective steps' to denuclearize". Aug 6, 2018. Return to "2018 North Korea–United States Singapore Summit" page.